As we close out 2014, we would like to highlight one of our editors, Edwin Barker. Mr. Barker is one of the top bassists on the American concert scene and has performed in North America, Europe, and the Far East. This interview was featured previously on our main site but now updated over here on String Visions. Edwin Barker graduated with honors from the New England Conservatory in 1976. That same year he became principal bassist of the Boston Symphony Orchestra at age 22. Over his career, Mr. Barker has performed and recorded with the Boston Symphony Orchestra, the Boston Symphony Chamber Players and with Collage, a Boston-based contemporary music ensemble. String Visions: Why did you choose the Double Bass? Edwin Barker: It was an accident. The grade school I went to in Plattsburgh, NY was associated with the State University Teacher’s College there. The school had a mandatory string program for all fourth graders. At the time I really didn’t know much about music. The music teacher noticed that I had fairly big hands and was rather tall for my age, and he asked me if I wanted to play the Bass. I thought he meant the bass drum. I was really interested in playing the drums at the time; this was in the mid sixties. It turned out that the teacher meant the “string” bass. I became pretty good at playing it. I was very fortunate that after the first introduction to the instrument my parents introduced me to an excellent string teacher. It caught fire and the rest is history. String Visions: Were your parents involved in your musical education and to what extent? Edwin Barker: I think it’s important that parents are involved because kids need direction. In my case they felt that if I wanted to take lessons they would be very happy to pay for them. I did want to take lessons, but the requirement was (this of course was in grade school) that I had to practice a half hour a day. If I was willing to do that, they were willing to pay for the lesson. I thought that was a fair deal and I did it. My teacher in Plattsburgh, Angelo LaMariana, was the string teacher and music professor at the state university college. He was very good with teaching young kids and his system incorporated elements of the Suzuki method, in that one parent was required to sit in and observe all the lessons. For every lesson I took, either my father or my mother would have to observe the lesson, and then having observed it, they would act as a kind of coach to make sure I did my practicing properly. That was his system and how I got started. By the time I was eleven or twelve and a little better at it, I became really motivated and practiced more. At that point my parents didn’t come to the lessons. It was deemed unnecessary because I seemed to have all the motivation myself. String Visions: When did you know you wanted to play in an orchestra and be a professional musician? Edwin Barker: Well, I always loved playing in orchestras. I always loved the sound of the orchestra. My parents had recordings of orchestral music playing in the house. When I was around eleven or twelve I went to a music camp in northern New York and I was exposed to a really famous bass teacher–Frederick Zimmermann. He was running the bass teaching at this camp and I was exposed to great teaching and playing. I was also exposed to chamber music and string quartet concerts, and those performances stimulated my interest in string playing. I always loved the texture of the orchestral sound, especially that sound as it pertains to the large string sections in those orchestras. I always wanted to play in an orchestra but at the same time this early exposure to chamber music also piqued a very strong interest in string playing and chamber music playing and also, as a result, solo playing. In my case I have a strong interest in all of those aspects of string playing and in particular how the double bass fits into those areas of string performance. Those interests intensified around the age of twelve or thirteen. String Visions: Did you know if you wanted specifically to hold a principal position specifically or any position in the orchestra? Edwin Barker: Well, my initial goal was to play in a great orchestra. I studied for a while with Peter Mecurio in the Los Angeles area. Then my primary teacher at the New England Conservatory was Henry Portnoi, a huge influence in my playing, and actually my predecessor as principal in the Boston Symphony. These teachers noticed that I had a good sensibility for not only orchestral playing but also solo playing. On occasion it would be mentioned that I would probably make a good principal bassist some day. Everyone wants to be a principal, generally speaking, but my initial goals were to be a high quality player and get a job in a major orchestra, to teach, and do some concertizing when it was appropriate and convenient–a rather well rounded approach to performing classical music on the bass. String Visions: Are there specific differences someone should keep in mind when preparing for a principal bass audition as opposed to a section member? 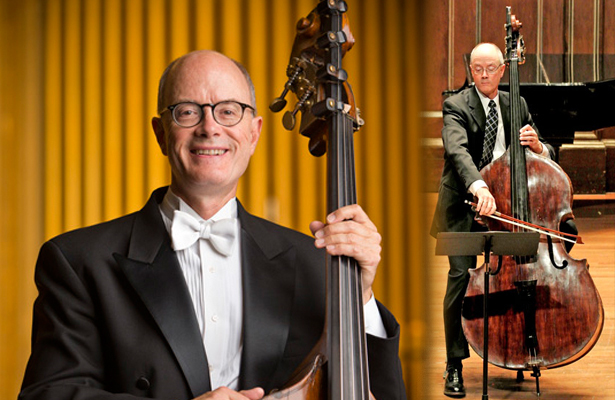 Edwin Barker: As a member of the Boston Symphony, I sit on the audition committee for the bass auditions. One of the things that I’m noticing now is that the people who are winning section jobs in major orchestras, specifically the Boston Symphony, are playing at a level so high that I often say to myself, “this player is a principal level player.” The level of music making is really sophisticated, sensitive, and very flexible. By flexible what I mean is that there is a strong ability to play solo repertoire on the instrument. To be a really good principal one has to be a soloist. At the same time, this flexibility also means that there must be a high level of accomplishment at playing orchestral repertoire as well. A good principal player is able to communicate and play well both as a soloist and as an orchestral player and do it in a way that is musically meaningful and sophisticated. He or she has to be a good leader and have exceptional rhythmic ability. The principal has to be able to lead the bass section and lead them in a manner that they will choose to follow without resentment. So there’s a real diplomatic aspect to all of that as well, and that is a skill that isn’t necessarily taught in music schools. String Visions: Do you find it is the excellent soloists or orchestral repertoire masters that tend to advance? Edwin Barker: There are really fine soloists who often audition for jobs. They are people who can play the bass really well and clearly have spent significant time thinking about solo playing, but don’t have a well-formed idea of how to approach the orchestral repertoire. There are other really fine players who can play the orchestral repertoire very well but are not as accomplished in the solo area. My experience in listening to auditions has been that the players who tend to advance are people who are excellent soloists who can play the orchestra excerpts with the same amount of care and sensitivity and musical thought that they apply to the solo repertoire. That’s very important. Orchestral life can be a very unhappy situation for a person whose most significant training has been in solo playing but who has not been able to make a career as a chamber player or a concertizing solo artist and has therefore “settled” for an orchestra position. Although I must add that classically trained bassists generally aspire to play in an orchestra. Orchestral performance is the bread and butter of our careers. String Visions: What is the difference between playing solos and orchestral excerpts in auditions? Edwin Barker: First of all, much of the solo repertoire for the double bass is written for high tuning. It’s commonly called solo tuning and is essentially a bass in ‘D’. On occasion we’ve heard people play their solos on solo tuning in auditions, and I definitely would suggest that no one do that. That will probably result in automatic disqualification. In the solo playing the candidate has to be brilliant, soloistic, and demonstrate some individuality to show strength of musicality. In the excerpts, part of the idea is to find a way to show that you can fit in the section, that you’re not going to be a maverick player. The issues in the excerpts tend to be generally fairly objective basic criteria. You have to play with rhythmic accuracy, really, really fine intonation, and play with a sound that has a lot of dynamic contrast, variety, and articulation. Often in auditions we pick excerpts to try to give the person the chance to demonstrate all of those aspects. String Visions: So, the basics are more important in some respects than musical individuality? Edwin Barker: That’s true. It’s the rhythm, intonation and dynamics of the sound quality. Those are the basics and those must be there. If the person doesn’t play in tune they’ll be disqualified, for example. As a matter of fact, Henry Portnoi always used to say that “the quality of a bassist’s standard of living is directly correlated to the quality of his or her intonation.” Beyond that, you have to be able to play in a manner that shows knowledge of the various styles of the repertoire being asked in a particular audition. You have to know the difference between playing Mozart and Mahler. You have to understand that and develop a sense of sound, style and articulation that will demonstrate the appropriate technical skill and musical understanding of the required pieces. We choose audition repertoire that shows all those musical characteristics. In a typical symphony schedule one week we perform a Mahler symphony, the next week we play an all Mozart or Haydn program and then follow that with a Pops concert featuring film music. Flexibility is key. Repertoire for auditions is picked to demonstrate that. String Visions: Is sound quality a major consideration? Edwin Barker: I think sound quality is a big issue. In Boston we have a very resonant, rich sounding concert hall, so it’s very important to play with clarity. You have to make the specific articulations, rhythms, dynamics, and sound qualities very clear to the listener when you are playing a piece of music or an excerpt. Whether something is legato or sostenuto, it needs to be clearly stated as such. If it’s staccato or marcato, in terms of articulation, the player needs to be able to clearly demonstrate those kinds of articulations. The overarching point being that music is a language, and language consists of many kinds of expressions: breathing, phrasing, articulation. All of those characteristics need to be very clearly and appropriately demonstrated. String Visions: What advice do you have for auditionees? Edwin Barker: Well, I always tell my students: If you play in tune, with the correct rhythm, dynamics, excellent sound quality, and a controlled sense of articulation, I can practically guarantee that you will advance to one of the higher rounds. Then from a professional point of view, anyone who makes the finals is certainly capable of handling the job. At that stage things become very, very subjective and I find myself listening for all kinds of subtle qualities. I think the best thing you can do in addition to rhythm, intonation, dynamics, and sound quality is to play with complete musical conviction. String Visions: Is there anything you advise auditionees not to do? Edwin Barker: There are a few things that I would suggest people not do. It’s important to understand the style of the orchestra for which you are auditioning. Different orchestras have different stylistic approaches to some degree, but I find that it’s always safer for you to play the way you play rather than trying to tailor the playing for a specific audition. For example, some people may think that in a particular orchestra the bassists play off the string and short, but in my experience listening to auditions, if the candidate tries to second guess what the committee is listening for, it often backfires, in that the candidate will then play almost everything off the string and short. The best thing is to be really musical and do what you think is appropriate. That said, I think a fairly conservative approach to playing for auditions is important. For instance, with respect to the recitative from Beethoven’s Ninth Symphony, there are a number of interpretations that are musically interesting. You can listen to various recordings and hear different approaches, but a fairly conservative meat and potatoes approach is best. Nothing too outrageous. In that way the candidate will tend to please most people on a given committee most of the time. String Visions: What are some of your responsibilities as a principal player in the Boston Symphony? Edwin Barker: Well, in the Boston Symphony most of the principals, including the principal bassist, are members of the Boston Symphony Chamber Players. It’s actually a separate subgroup under the auspices of the Boston Symphony. We have our own season of concerts, and those principals work together in a chamber music context all the time. In the orchestral setting there is much that goes on that is not immediately obvious to the lay listener. For instance, I’m always keeping an eye on the concertmaster. We all do, actually. I am also in strong peripheral contact with my stand partner and the members of the bass section. The principals are also in visual contact with one another as much as possible. Another aspect of orchestral playing is learning how to follow a given conductor.They all have different styles of producing beats and beat patterns and often the BSO, for instance, tends to play pizzicati or certain gestures a little behind the beat of the conductor. So the question is how far behind. It often is incumbent upon principals to lead their sections in those instances. In the orchestral setting there’s a lot of housekeeping that has to be done by the principals, most importantly bowings. We have to make sure that the bowings are coordinated not only within the section but also with the other strings sections. String Visions: How do you coordinate bowings with the other string sections in your orchestra? Edwin Barker: In the Boston Symphony we have a bowing score for many pieces that the concertmaster will bow and then send around the orchestra. The violas will bow accordingly and then the cellos and then basses and I’ll bow accordingly. I’m a big believer in unison bowings with the other strings. When I first joined the Boston Symphony many of the bass parts were bowed differently from the other strings in certain gestures. I feel that generally the basses should be part of what the other sections are doing. For instance, if there’s a down-bow or an up-bow gesture in a given phrase, I feel that the basses should participate in that same musical movement. However, because the bass is a bigger instrument, the strings are longer and the bows are shorter, occasionally it’s necessary for the bass section to do its own different bowing that will accommodate the same kind of phrase shape. That would be my decision in coordination with a conductor’s wishes. String Visions: Does who you are playing with affect how you play a certain passage? Edwin Barker: The orchestral bass is an interesting and versatile instrument and ensemble issues often determine how we play. For example, I have found that my intonation differs depending on the given instrumental combination. I have to play with a different kind of intonation when I play with strings than when I play with winds. Because the bass tends to fit nicely in either string or wind textures bassists must adjust accordingly for intonation and the use of vibrato. Sometimes when I’m playing with winds I’ll use a little less vibrato or maybe none at all and if I’m playing with strings, a little more. Again, awareness and flexibility are important.